The Mulleavy Sisters — Kate and Laura — are the brains behind the high-end label Rodarte, whose black booties I would gladly give up limbs to get my hands on. Rodarte just launched a rug collection with The Rug Company and, as to be expected, the pieces in this capsule collection are to-die-for but so not cheap, starting at $1845. Yes, starting. There are five rugs, which are comprised of hand-knitted Tibetan wool and have swirly, multi-color designs, save for the green and black block version. According to Domaine, the Mulleavys were inspired by a variety of sources when crafting the rugs, like the the scorched earth of Death Valley and fairytales. Honestly, I can definitely see those sources of inspiration in the rug patterns. I love each and every rug. But sadly, I can grab Rodarte for Opening Ceremony sunnies or one of their pricy hoodies before I can throw down 2k for a rug. Yes, rugs are a fab decor element that can add to and open up any room, but you also, you know, walk on them, as do your pets, guests, etc. It's hard to justify dropping that much cash on something that you essentially wipe your feet on all day long. I'd never let anyone walk on my floors with shoes if I owned one of these works of art! Rodarte designed a super cute, lunch bag-sized canvas tote for Starbucks that I got on clearance a few years back and it was a significantly more reasonable purchase than one of these rugs (however gorgeous they are). That sack (and my coveting of the rug collection) make me wish Rodarte would do more stuff at mass, like their Target collaboration of yore (which you can still score on eBay if you're willing to dedicate the time). I want to move into this room and stay there for the rest of my life. Can't you just imagine laying sprawled out on this floor piece?! I love the raspberry, fruit-on-the-bottom yogurt swirl. And that couch is something else. This rug is on my wishlist. How 'bout you? 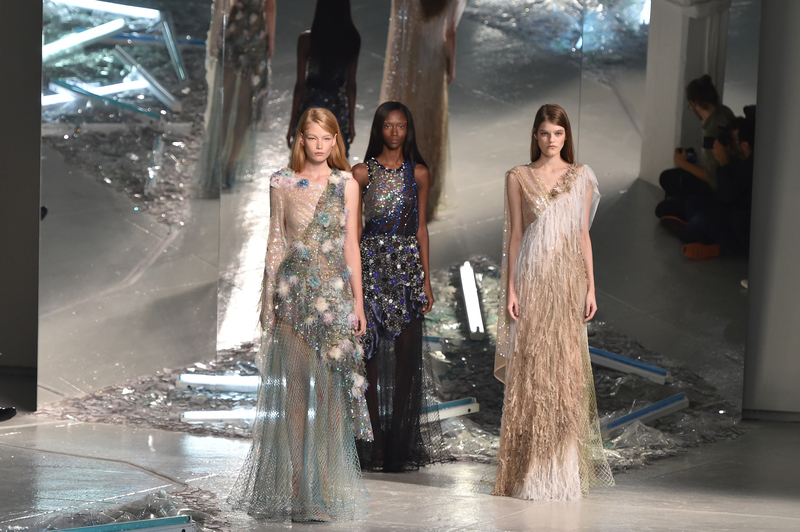 That said, here are three mass market items I want to see Rodarte return with so everyone can indulge a little. Yes, they are a truly luxe brand, which translates to "not for everybody," but the label has proven themselves capable of distilling their look into affordable collaborations. Nothing feels better than stepping into a lush bath sheet after a hot (or cold, if you need to wake the heck up) shower. A lavishly patterned Rodarte towel at an affordable price would be like heaven in the bathroom. The brand created a vase-shaped dress. Insert wink-and-nudge here. Years ago, Missoni did their signature print vases for their Internet-breaking Target collab. How about a Rodarte vase? That would punch up an ordinary bunch of roses, wouldn't it? Why not cute staplers, pen holders, and such?! It would make going to work and sitting at a desk for eight hours much more fun, fashionable, and (most importantly), tolerable.